PHEW! Did you hear that collective sigh of relief this morning? We sure did. 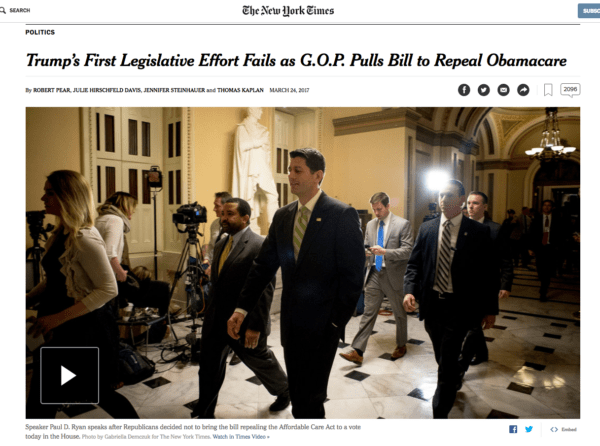 Today’s New York Times recap of 45’s failed health care reform bill is classic Grey Lady: Concise distillation of a complex issue, no sparkly prose or flowery language needed – just the facts, ma’am, with a couple of underhanded digs thrown in for good measure. Love it. The term “National treasure” sure does get thrown out there a lot, and oftentimes the recipient is undeserving. 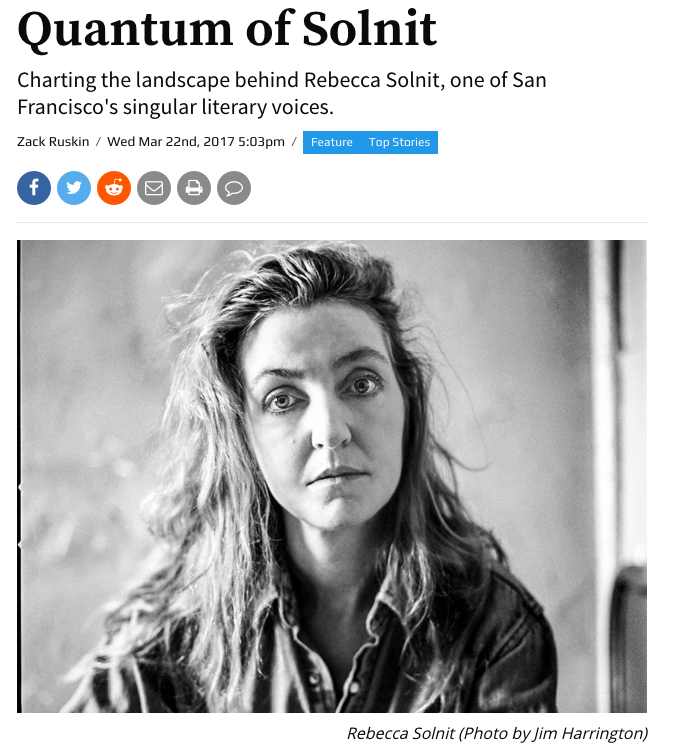 But we’ll be damned if Rebecca Solnit isn’t a bona fide candidate for National Treasure. We’re lucky enough to be in the same city that Solnit calls home, and our local alternative paper, the SF Weekly, was nice enough to feature Ms. National Treasure on their cover. Read the excellent feature and see if you agree with us. And if you’re in SF, stop by the wonderful Green Arcade bookstore, owned and operated by yet another national treasure – Patrick Marks. There we go again, throwing that term out there! Bonus props since this was editor/writer Pete Kane‘s first issue as the new Editor-in-Chief. Congrats, Pete! 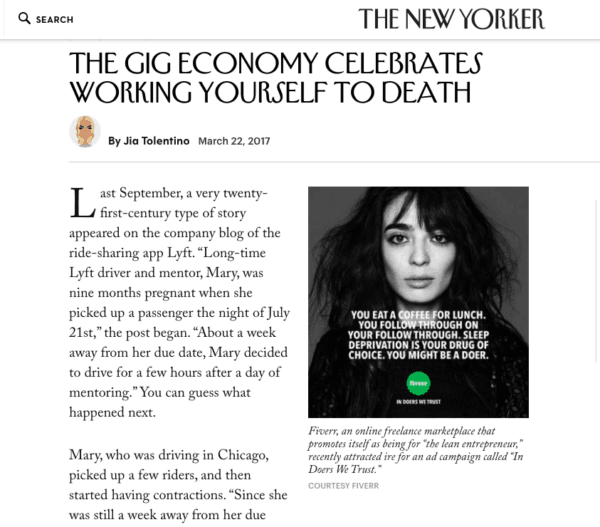 Jia Tolentino‘s superb takedown of the perils of the “gig economy” is a fantastically written piece on a fantastically depressing sentiment that our country seems to praise: that of working oneself to death. Calling to mind the hilarious old “In Living Color” sketches where having one job was the pinnacle of laziness, the idea of hard-working Americans stringing together gig after gig to barely make a living should be the poster children for why our economy needs fixing, and not why the gig economy is “working.” Read the article while you’re waiting for your Lyft ride. It’ll make you think twice. While it’s not an article but an NPR interview, the Fresh Air segment with writer/author Jane Mayer on the Mercer family is eye-opening and more than a little frightening. Hold on to your latte when you hear the story about the scientist that the Mercers are funding, a man who thinks that nuclear wars benefit humanity (!). It’s chilling stuff. The Mercers want to stay out of the limelight and it’s journalists like Mayer who are shining a needed spotlight onto who these people are and more importantly, what their motives are. You can run but you can’t hide from good journalism.